ACTIVA BioACTIVE-CEMENT, developed by dental research company and manufacturer Pulpdent Corporation, received the top rating from REALITY in the “Resin Cements – Dual-Cured Only – Self-Adhesive” category. REALITY, an online publication that evaluates dental products, has published a review on the bioactive dental cement from Pulpdent Corporation. – Bioactive dental cements help protect teeth from acid attack caused by dietary sugars. ACTIVA BioACTIVE-CEMENT responds to pH changes in the oral environment through a release and recharge of calcium, phosphate and fluoride. – This unique chemistry supports the natural remineralization process with the release of calcium, phosphate and fluoride and helps form a seal between the material and the tooth. – This protective seal helps prevent new cavities from forming under dental crowns and bridges. According to the REALITY review, dentist evaluators were generally pleased with the consistency and handling of ACTIVA BioACTIVE-CEMENT. Evaluators found that the cement “cleans up nicely” and used the bioactive dental cement for both single and multi-unit restorations. REALITY reported “virtually no dislodgements and post-cementation sensitivity.” One evaluator used ACTIVA BioACTIVE-CEMENT to salvage failing crowns for medically compromised patients. 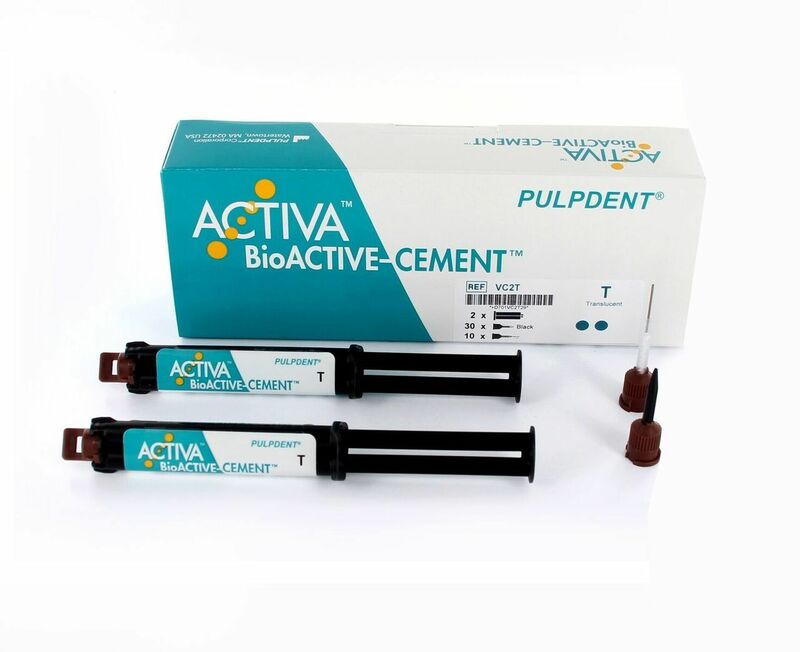 ACTIVA™ BioACTIVE-CEMENT is an esthetic bioactive dental cement that imitates the physical and chemical properties of teeth. It contains no Bisphenol A, no Bis-GMA and no BPA derivatives. PULPDENT® Corporation is a family-owned dental research, manufacturing company and leader in bioactive dental materials. ACTIVA BioACTIVE™, developed by Pulpdent, is a bioactive restorative material that behaves much like natural teeth and stimulates the formation of apatite, chemically bonds to teeth and helps protect against decay. For over 70 years, Pulpdent has been committed to product innovation, clinical education and patient-centered care. More on the dental materials market in the US can be found in a series of reports published by iData entitled the US Market Report Suite for Dental Materials. This report covers the following market segments: dental cements, impression materials, direct restoratives, temporary restoratives, bonding agents, core build-up materials and anesthetic materials. The iData series on the market for dental materials covers the U.S. and 15 countries in Europe including Germany, France, the United Kingdom (U.K.), Italy, Spain, Benelux (Belgium, Netherlands and Luxemburg), Scandinavia (Finland, Denmark, Sweden and Norway), Portugal, Austria and Switzerland. Reports provide a comprehensive analysis including units sold, procedure numbers, market value, forecasts, as well as detailed competitive market shares and analysis of major players’ success strategies in each market and segment. To find out more about dental materials market data or procedure data, register online or email us at [email protected] for a US Market Report Suite for Dental Materials brochure and synopsis.